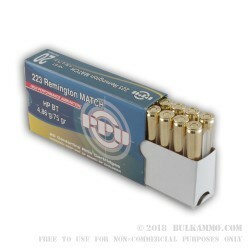 Heavyweight .223 Remington loads such as these from Prvi Partizan are a popular choice among precision AR shooters as well as for short-range defensive shooting that requires a little more muscle for the task. This is due to the use of 75-grain hollow-point boat tail (HPBT) which carry a greater ballistic coefficient out to longer distances and exhibit keen drag-resistance and stability while in flight. The HPBT's performance is owed to its construction which feeds lead into a preformed copper jacket, resulting in a lead core of consistent density and an unmarred jacket with distinct dimensional quality. While the hollow cavity of the HPBT is not designed for fragmentation, its terminal effect is greater out of short barrels than lighter FMJ loads, making it a common option for home defense with an SBR. Each projectile is loaded into a reloadable brass casing that has been heat-treated for proper chamber fit and strength throughout repeated usage. The brass casing is also home to a measure of clean-burning powder and a non-caustic Boxer primer that won't leave behind metal-eating residue in your bore or on your bolt. Since the projectiles used in this load weigh 75 grains, be sure to use a barrel twist rate of 1:8 or faster. Prvi's ammo is highly respected in the United States by competitors and law enforcement professionals due to affordable prices and configurations that are backed by 90 years of experience. Q: Are the cases suitable for reloading? Posted On: 11/9/13 By: Charlie C.
A: Yes. We have found these boxer primed brass rounds from Prvi Partizan (PPU) have held up well during the reloading process. One member on our team reloads a variety of .308 cartridges and notices this PPU brass holds up just as well as other manufacturer's brass. 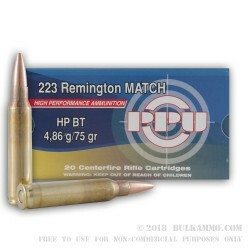 These .223 Rem rounds should be no exception!